Two historical professional leagues that have a huge place in sports history is the ABA – American Basketball Association and USFL – United State Football League. These two leagues have left a mark in both professional basketball and football. While one league ABA was able to accomplish their goal of merging with stronger NBA and the other USFL was not able to merge with the NFL only to receive a $1 payment from their lawsuit with the NFL. Sports Logo History and Sports Team History has embraced both leagues by showcasing both the team history and logo history. 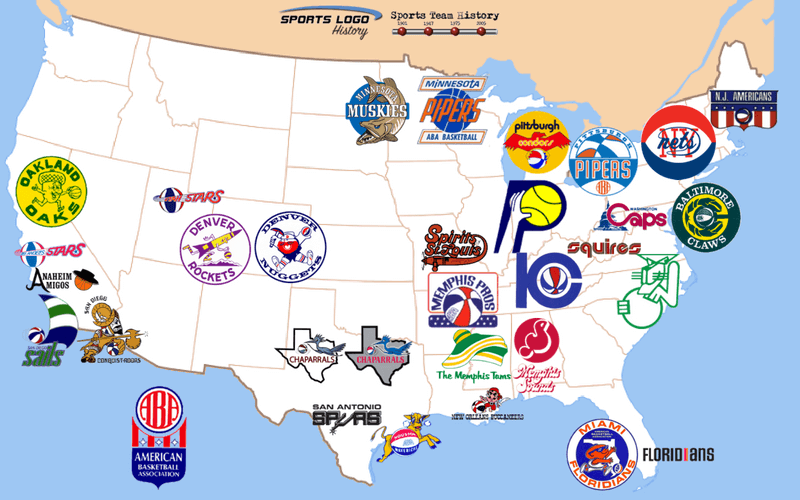 The ABA started with the original 11 teams of Anaheim Amigos, Dallas Chaparrals, Houston Mavericks, Indiana Pacers, Denver Rockets, Kentucky Colonels, Minnesota Muskies, New Orleans Buccaneers, New Jersey Americans, Oakland Oaks, Pittsburgh Pipers. The league had a total 31 teams during the 10 year period from 1967 to 1976. The ABA distinguished itself from its older NBA with a more wide-open, flashy style of offensive play, as well as differences in rules a 30-second shot clock as opposed to the NBA’s 24-second clock and use of a three-point field goal arc. Also, the ABA used a colorful red, white and blue ball, instead of the NBA’s traditional orange ball. In addition, the ABA pioneered the now-popular slam dunk contest at its all-star game. The USFL played for three seasons, 1983 through 1985. The league played a spring/summer in each of its active seasons, however in the 1986 season they were scheduled to be played in the autumn/winter, in direct competition against the long-established NFL, this was done at the urging of New Jersey Generals majority owner Donald Trump and a handful of other owners as a way to force a merger between the leagues. As part of this strategy, the USFL filed an anti-trust lawsuit against the National Football League in 1986, and a jury ruled that the NFL had violated anti-monopoly laws. However, in a victory in name only, the USFL was awarded a judgment of just $1, which under anti-trust laws, was tripled to $3. This court decision effectively ended the USFL’s existence. The league never played the 1986 season, and by the time it folded, it had lost over US$163 million. However, the USFL ceased operations before its fourth season was scheduled to begin. 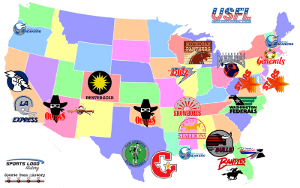 Please check out the new state maps of both ABA and USFL with every team’s location within the USA. Two historical professional leagues that have a huge place in sports history is the ABA - American Basketball Association and USFL - United State Football League.